Daily averages of SOHO/CELIAS/SEM disk integrated solar soft X-ray and EUV flux measurements. 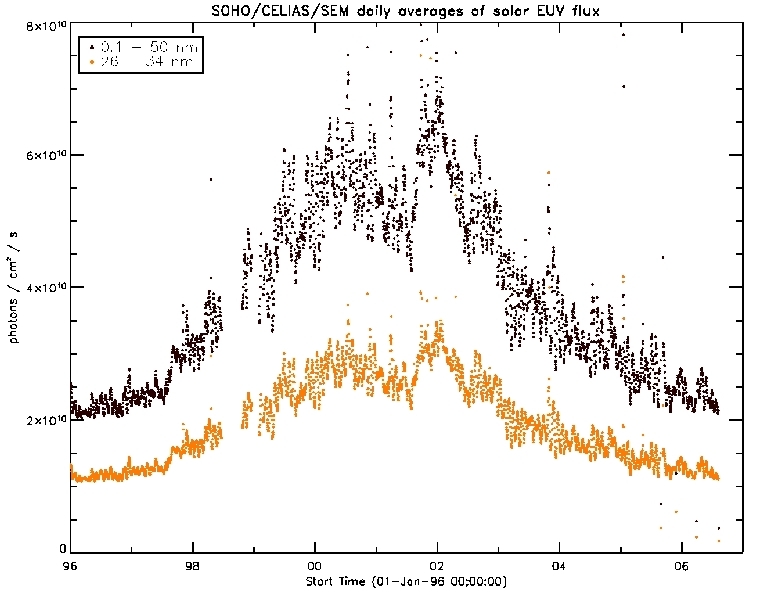 The SOHO Solar EUV Monitor (SEM) is a highly stable transmission grating spectrometer that has made nearly continuous full disk solar irradiance measurements since launch within an 8 nm bandpass centered at 30.4 nm, as well as broadband solar soft X-ray and EUV flux measuremens in the spectral region between 0.1 and 50 nm. It is this radiation from the Sun's hot corona that controls the composition and dynamics of Earth's upper atmosphere. 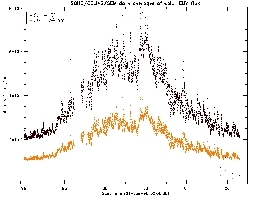 An increased knowledge of the absolute solar flux and its variability in the EUV and X-ray regions over a long time scale is therefore important for our understanding of the solar-terrestrial connection.